Polish Angel Wings - Chrusciki. 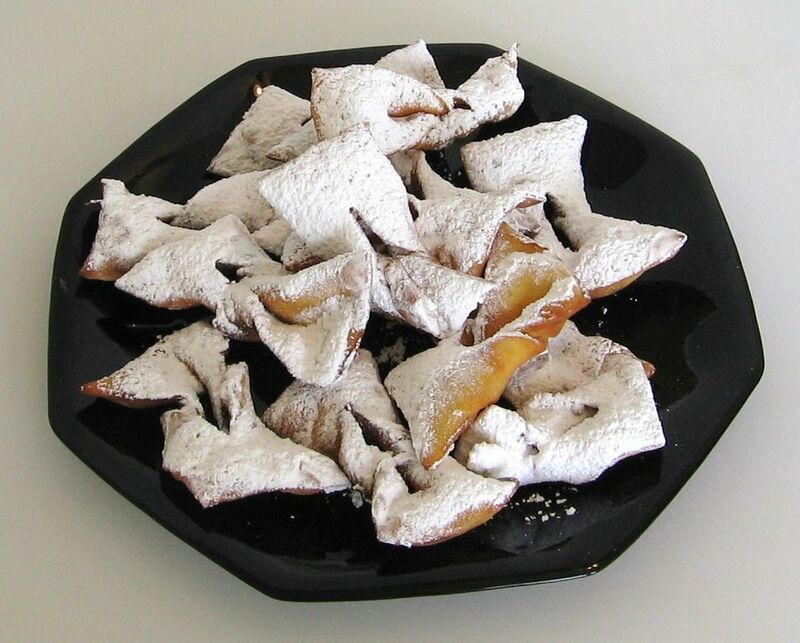 Chruściki is a Polish word for a non-yeast-dough, bow-tie shaped pastry that is fried and dusted with confectioners' sugar or drizzled with honey. In English, they are known as crullers or angel wings. Also Known As chrust faworki, chrusty and just plain faworki. In English, they are known as angel wings, bow-ties, crisps, and crullers. Examples: Chruściki fry up very fast so make sure you watch them carefully or they will burn. Traditionally, chruściki, also known as chrust faworki (HRROOSST fah-VOHR-kee), which means "little twigs," or just faworki (little favors reminiscent of ribbons that knights gave to their ladies fair), are associated with the pre-Lenten feasting of Tłusty Czwartek or Fat Thursday (Shrove Thursday). Another fried dessert, pączki, which are Polish bismarks or doughnuts, also are served with abandon. Carnival season in Poland is celebrated from Twelfth Night until Ash Wednesday. On Shrove Tuesday or Ostatki (Fat Tuesday in the U.S.), pickled herrings and vodka are consumed in great quantities, so the day is also known as Śledziówka (Herring Day). Because these light-as-air fried bow-knot pastries are a little labor intensive to make, they are typically only served on special occasions like weddings, holidays, christenings, graduations, St. Joseph's Day and other feast days. When we make these melt-in-your-mouth pastries, we're suddenly 5 years old again at a Polish wedding, inhaling the aroma of freshly fried chruściki and elbowing our siblings out of the way for first dibs at the dessert platter passed at family-style Polish wedding dinners. A less time-consuming version of Polish angel wings is lazy chruściki or chruścik lany, better known as Polish funnel cakes. And a fancier, and less-familiar, version of chruściki would be Carnival Rosettes, better known as róże karnawałowe, served on Fat Thursday in Poland alongside pączki. Remember, Fat Tuesday in Poland is reserved for eating herring! Step-by-step instructions for making chrusćiki.